The English absolutely love their pubs, as do many tourists, who embrace the pub culture that has become so renowned in this great country. Having come to the UK from Australia, it is hard to imagine floating through one week without at least a single trip to a pub. It is almost unheard of and an horrific thought if you ever do share this information with your English friends. Shoreditch is home to some of London's most historic and loved pubs, one such one being The Eagle located off City Road. Obviously it is not just this nursery rhyme that makes The Eagle so flash, but of course the menu. I headed to The Eagle with a friend who works close by, we decided to dine in the outdoor area over a celebratory class of rosé. The beer garden is adorned with plants, long park-style benches and adorned with a mixed wooden and brick fence with gorgeous fairy lights. Having settled in we looked over the lunch menu and opted for their signature Fish finger sandwich and double cooked chips along with the Salt & pepper squid with lime mayonnaise and Pan-fried Chorizo with Focaccia bread. The wait was not long and the food came out all at once roughly fifteen minutes later. The fish finger sandwich was a refreshing sight for a pub lunch. Now, in other pubs I have been served some Sainsbury's wholemeal bread with frozen fish fingers, heated just enough to make them edible, along with five or six chips and tartar sauce in a sachet. As you can imagine, the sight I saw was much more appetising. 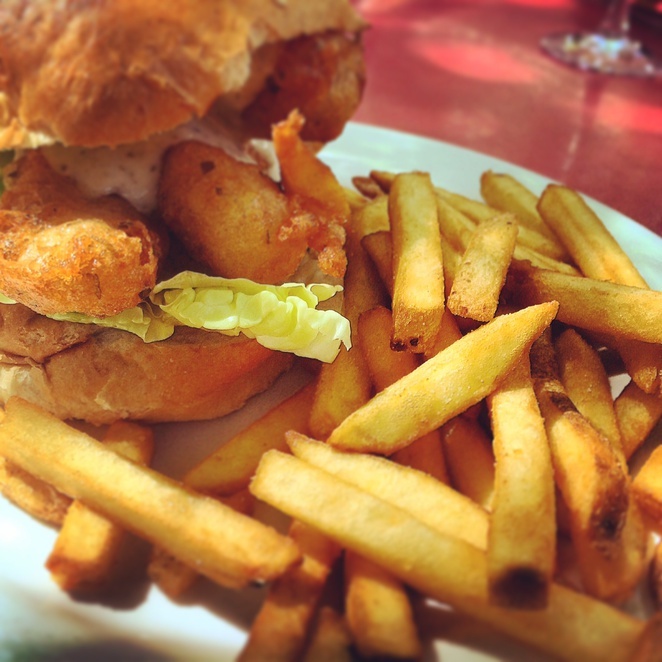 The fish was battered fresh, the roll was crusty and warm, the tartar was homemade and the chips were crunchy. All in all a win for their lunch special. 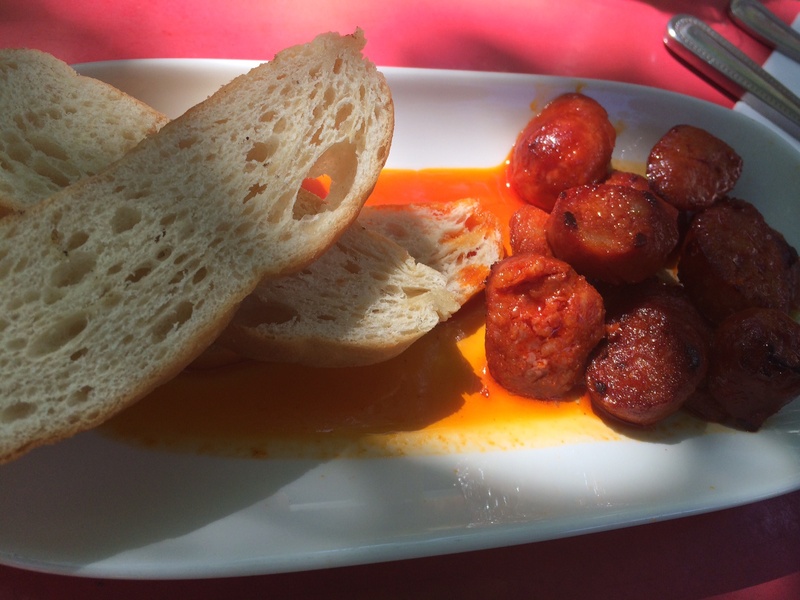 The chorizo was another choice starter, with the immense flavour and delicious when combined with the toasty focaccia. 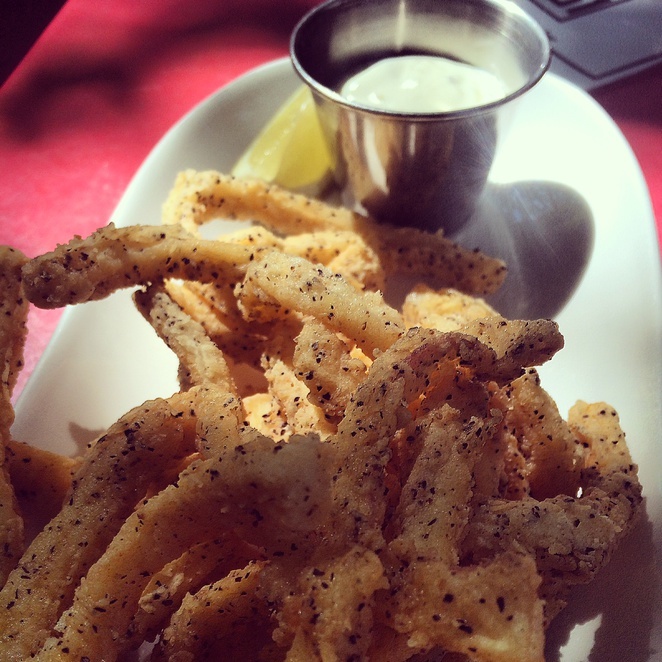 Lastly the squid was seasoned to perfection with a zingy lime mayo that accompanied it ideally. Lunch is served seven days a week and all modern meals are made with carefully sourced ingredients and cooked to order to ensure freshness for customers. Like many other pubs it is no surprise that The Eagle also have a scrumptious roast that is served on Sundays. With a cult following their roasts have won the hearts of many locals. The Eagle is home to a superior line-up of British meats, including succulent beef and farm-assured chicken (plus a veggie option), alongside homemade Yorkshire puddings, seasonal veg, crunchy potatoes and covered in gravy. If you find yourself in Hoxton head over to The Eagle, bring some friends and enjoy their cold beers and lagers as well as their delicious cuisine. The food looks excellent. I only knew the first verse to that nursery rhyme, so thanks for teaching me the third.